Your heart starts beating faster with every stroke of the gator's tail swimming in the water and your palms undoubtedly get a bit sweaty as you see him coming straight towards you. As you cast your line and snag one of these prehistoric beasts, there is no turning back. Experience the fight of your life as you reel in the King of the Everglades closer and closer. Whether you prefer to finish off your hunt with a bang-stick up close to this huge predator, or a bit longer range approach with a rifle, or a weapon in between - we guarantee you'll be talking about this hunt for a lifetime. With over 40,000 acres of private “honey holes”, we will help you find the gator (and the adventure) you're looking for. 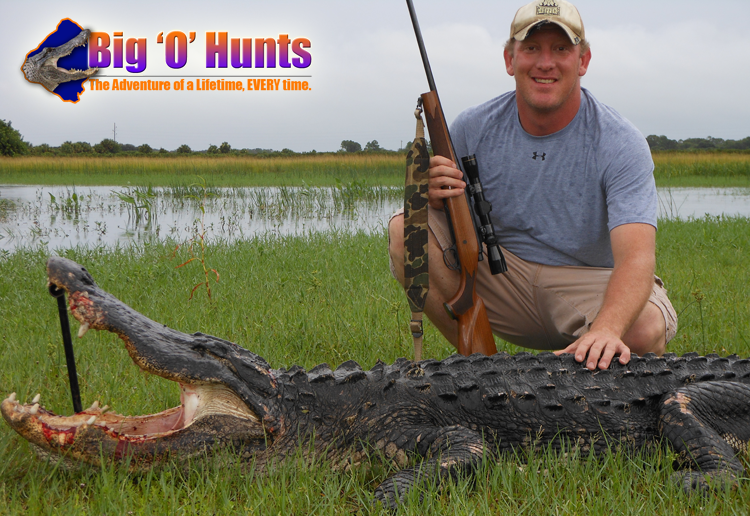 Big ‘O’ Hunts is a local provider of guided alligator hunts for both beginner and experienced hunters alike owned and operated by Casey Ward, a South Florida native whose family has hunted in the Glades for generations. Feel free to give us a call at (873) 243-4304 with any questions about your next hunt. Head here for our Frequently Asked Questions.